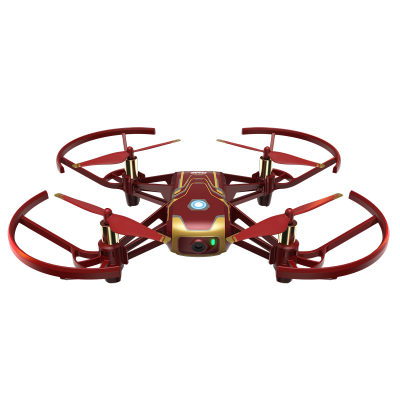 With Tello Iron Man Edition, don't just learn to fly – conquer the skies. This fun mini drone also comes with an immersive app, allowing you to explore the world of the Avengers. propeller tips dipped in gold. The Tello Hero App provides an immersive experience, and a peek into Iron Man’s world. With FRIDAY, Iron Man’s AI assistant, you can complete missions while exploring Tello’s expansive range of possibilities. Thanks to a comprehensive user guide, learning how to fly is no longer just for comic books. Supported by DJI flight tech, Tello Iron Man Edition ensures safety in the air no matter where adventure takes you. Features like Low Battery Protection and propeller guards make sure that Tello’s defenses are up for the challenge. These and other elements allow you to take on missions without fear. Master Tello’s flight modes to perform heroic feats and save the day. Creative features like 360, Throw & Go, and 8D Flips make flying a lot easier and much more fun. Tello Iron Man’s incredible camera system grants an engaging FPV view. 720p HD transmission, 5MP photos, and Electronic Image Stabilization ensure an advantage over Iron Man’s foes. Up to 13 minutes of flight time and a 100-meter maximum distance make exploring new perspectives fun and easy. Tello Iron Man Edition supports the Tello EDU app and the Swift Playgrounds app, as well as Python and Scratch, a visual programming language. Thanks to these compatibilities, you can program the drone to fly and perform tricks just as Tony Stark programs his technology to combat malignant forces.